This product comes in several different fragrances. I will let others describe the scents. Trust me, it's better that way. Choice of fragrance makes no appreciable difference in the shaving performance (I've tried all of them except the latest one). This product is close enough to perfect for me. IMO, choose a scent you like, and you're set. Lubrication: excellent - good balance between "slip" and "grip"
Few shaving products are as good as this, though I'm sure there are arguably-better soaps and creams available. You are highly likely to be satisfied with Harris soap, unless the scent doesn't agree with you. If that happens, you know who to call. Last edited by brothers on Thu Nov 08, 2018 6:40 pm, edited 1 time in total. Just a reminder gentlemen, this thread is intended for reviews only and comments should be placed elsewhere. 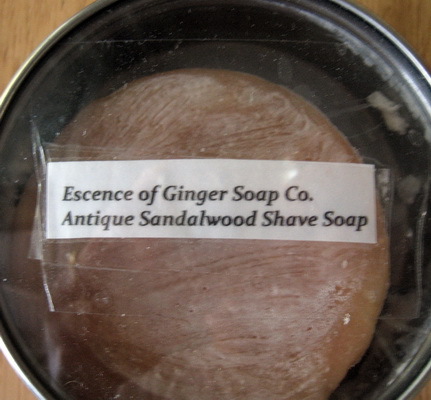 Escence of Ginger shaving soaps, as well as several other kinds of their soaps, are available at their web site and on Etsy. The products are made by a family business in Mississippi. The shaving soaps are made with goat milk and contain lanolin and tallow. The product packaging is nothing fancy, just cellophane, but it does its job adequately. Upon opening, one notices the very light and pleasant sandalwood scent, which strengthens slightly with lathering but remains somewhat faint. The company recommends soaking the bar in warm water for a few minutes before lathering, which I did. I then built lather with a Rooney Finest. The lather was created fairly easily but was never really fluffy or copious. On my face, the lather faded away very quickly during each razor pass, providing very little cushion at all and requiring one reload of the brush. However, with a Feather AS-D2 and a Gillette Platinum Plus on its third use, the glide was very, very slick throughout. Following the shave and a face rinse, my skin was very soft and nicely moisturized, and it stayed that way, probably due to the lanolin. There was very little if any residual scent on my skin. For some reason the lather residue was quite difficult to remove from the brush, requiring a lot more time and effort than usual, which was a little irritating. Overall I would rate this soap as good but not great. Although not expensive at $10 shipped for a 3.8+ ounce bar, it also cannot really be called a wonderful bargain. I would say that it is a good choice for someone who likes or needs a very lightly scented soap and who has skin that tends toward dryness, because of the extremely good skin care. I apologize for not taking a picture of the soap before opening the package and using it. 7. Texture: Describe the look and feel. Glossy and firm coming out of the tube. 11. Endurance: Does it require reapplication during or between passes? Yes, as is my normal procedure when lathering with the brush. 18. Remarks: Just what one expects from one of the best traditional purveyors of gentlemen's shaving products in the world. No complaints, Many positives. Several years past, I tried Harris-made GreenPond shaving cream, and I recall that the fragrance was noticeably overdone. With that in mind I didn't quite know what to expect from the new shaving cream from Harris. I couldn't be happier with it. It has a touch of spice, which seems exactly perfect. I admit I haven't been overly enthusiastic about the Sandalwood genre as a whole, but I am firmly enthusiastic about the D.R. Harris Sandalwood shaving cream. Harry's Shave Gel with $5.00 off and free shipping is the absolutely best cream or soap I have ever used. Combined with essential wholesale shave jelly, Harry's provides a close non-irritating shave. Blade glides across the face like skating on an ice rink. A small squirt on a silvertip provides quick beautiful lather. Face feels wonderful post shave. The ingredient list contains higher end stuff. Harry's easily beats any shave cream priced at 4-5 times greater. Suggest giving Harry's a shot. Big payoff at a low cost. Another reminder, this thread is for reviews only. rbahola this is not directed at you, rather the deleted comments made after your post. 6. Fragrance: Does it have a scent? Identical to Krampert's Finest Aftershaves by the same names. 11. Endurance: Does it require reapplication during or between passes? Yes, as is my normal procedure when lathering with the brush. 18. Remarks: An excellent soap, non-tallow formula, simple ingredient list (5) not counting fragrance. Doesn't dissipate on the face. Seifenglatt makes a good soap, and when combined with Brian Krampert's well-known aftershave fragrances, the results are enjoyable. The Frostbite version is menthol. After being on my face for a few moments, the menthol cooling starts and remains cold throughout the shave. There's no menthol in the Acadian Spice Bay Rum, just the rich and effectively spiced Bay Rum scent that is specific to Krampert's. The soap bursts into lather even with my hard water, and I'll probably limit loading time to 15 seconds on the soap before going to the lather bowl. No complaints, Many positives. I am impressed by the slickness and overall effective performance of this soap in both products. I was looking for a soap to use in the upcoming warmer months, preferably with a light to imperceptible scent. This fit the bill perfectly. This review is based on my first shave with the product. Lathering: Required about the same amount of water as my DRH Marlborough. Bowl-lathered until the brush was loaded with enough for three passes. Lather was stable and slick. Enough cushion to protect without hydroplaning. Cleanup: Lather rinsed off my face and from the brush easily. Skin care: I had washed my face in the shower and there was no additional drying from the soap. No burning or irritation. 5. Cost per ounce: $3.05 per oz. 6. Fragrance: Does it have a scent? Masculine fragrance with a peppery, citrus top note rounded by woody cedar wood, juicy plum and violet leaves that finish into an ambery base of leather and tobacco. 9. Lubrication: Is it slippery? Did it help the razor slide smoothly? Very slick. 13. Moisturizing: Does it add/restore moisture? Very well. Does not dry the face. The post face feel is super smooth and almost powdery. Excellent. 14. Brush lather: Will a brush make it lather in a bowl? I loaded for 15-20 seconds and it exploded into an excellent lather. No difficulty with hard water. 16. Remarks: Clearly a top shelf shaving soap product. #63 has a fragrance that has received many positive reviews. I enjoy it a lot. I am considering buying the AS balm. They also offer this fragrance in a brushless shaving cream in a metal tube. I'm also considering buying one of those for days when time or space is limited, such as when traveling. I have no negatives to report. The price is mid-range and performance is tops. This is a great value in a quad-milled shave soap. After having used other French soaps (MdC, Provence Sante, Institut Karite, L'Occitane Cade and Monsavon), based on fragrance, price, and performance (slickness, lather, and fragrance are my personal high-expectation points) I honestly prefer Pre de Provence #63. Gron Lycka Old Fashion Whipped Shaving Soap Handmade in Sweden by Carina. This non-tallow shaving soap contains a variety of products that are skin-healthy, and yields yet another superior lathering soap. Super slick and cushioning, the protective lather seems to enhance the performance of the razor and blade in the same manner as the two soaps listed above. The fragrance is a pleasant mild lemon scent. Leaves the skin feeling soft and smooth. The term shaving treasure definitely applies. This soap comes in a 250ml tub. Carina accepts Paypal and her customer service is exemplary, just as the two other vendors listed above. I'm a big fan of brushless creams. For me, they are actually less likely to make my fussy face red than most lathering creams and soaps. I don't use them exclusively, but I do like them, so I was excited to check out Rasoline, from the storied French firm of Molinard in Grasse. I fully realize that most SMF gents prefer lathering shave creams over brushless. Nevertheless, even if you just like to have a brushless in your bathroom cabinet for occasional use (or perhaps for travel), I can highly recommend Rasoline. Very good product, IMO. Scent: Classic, old-timey. Interestingly, despite a high almond oil content, the scent doesn't seem almond-like at all. Price: I think I paid $15 at Lee's Razors: not cheap but hardly extortionate. Performance: I was very impressed. I started with a hot shower, and face-washing. I followed that up with splashing some more warm water on my face at the sink. Then I squeezed a couple of decent-sized dollops in my hands and spread the cream into my beard. I worked it into my beard for a couple of minutes and then shaved. The cream stayed moist and effective through a pretty thorough close shave. The glide was excellent, as was the protection. My face felt good after shaving, with no rawness whatsoever. With all the almond oil in the product, I'd been wondering about the "rinse" factor, but I found that it rinsed off cleanly, with no greasy residue at all. I noted from one online review that at least one gent felt that his razor gummed up with this stuff, but I didn't find that. Brushless creams are always a bit more prone to leaving creamy debris on your blades. I find rinsing under fast-running water to be a big help, and (if necessary) quickly popping the blade out for a more thorough rinse. Anyway, it wasn't a big deal with this cream, IMO. All in all, it's definitely a thumbs up for me. Recommended. 11. Endurance: Does it require reapplication during or between passes? Not necessarily, but the lather doesn’t dissipate in case the user wishes to reapply. I apply once only and splash water on my face for touchup. 18. 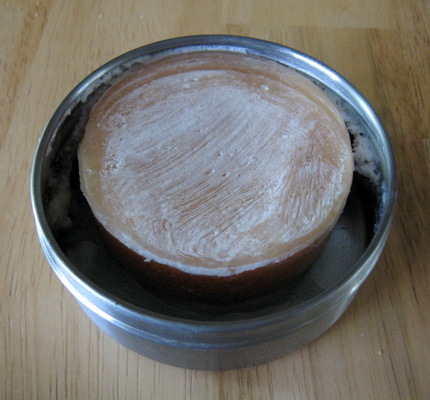 Remarks: With my synthetic brush, the Salter’s Solid soap is as good as it gets. Cheap and good! This one is good enough to be my one and only. 17 thumbs up on the review gary. As most here know, i have been a long time fan of trumpers rose, but ever since I started using this salters soap i haven't touched the rose once. Here is my short review and comparison of 19 soaps. EDIT: It took a while but I have located the above reviews and comparison posted by SMF member hicabi over ten years ago. You're welcome! ARKO: Tallow based. Lather softening capability and cushion is second to Valobra, and better than DR Harris (in my opinion). I like the scent, but some don't. Price is cheap, I think it is the best value in wet shaving. 75g. QED: Great scents. Rich lather. However, the lather does not soften the beard like others. So I don't use it much. If your stubble is not thick, this might be the perfect stick. Scent does not wash away, but lingers on for a while. Bottle design is practical, in that one can close the cap without screwing the soap back in. But the bottle size a bit large, considering there is only 52g of soap in it. I'd prefer a smaller bottle for travel. DR Harris: Very nice scent. Best bottle design; small and functional. Excellent for travel. Very expensive, considering that you're getting only 40 grams of soap. Lather softening capability is better than Trumpers and QED, but not as good as Valobra, Arko, AOS or Tabac. I am not using it. Again, if you're stubble is not as thick, you might be perfectly happy with it, many gents are. Valobra: Excellent beard softening capability and cushion, very similar to Art of Shaving soaps. Scent is not so good. But comfort is more important to me than scent, so this one gets used a lot. Pricewise, it is neither expensive, nor cheap. 50gr. Speick: OK scent. Although it is tallow based, beard softening capability was lacking, hence I got uncomfortable shaves. Looks very small, yet it is 50gr. GFT Almond: Wonderful scent. I've never experienced any other soap creating so much lather so quickly. Unfortunately, I got uncomfortable shaves. Were it not the case, this would be the soap I would use everyday. Beard softening capability is lacking, better than QED, but slightly inferior to DR Harris. Crabtree and Evelyn Sandalwood: Nice scent. Great price ($18 including Teak bowl). Great performer; I got more comfortable shaves with it, than GFT Almond. It is, however, inferior to some tallow based soaps (AOS, Valobra). AOS Lavender: Best beard softening capability and cushion, period. I get the most comfortable shaves with this one. I use it almost daily. Scents are inferior to products from GFT, Dr. Harris, C&E, T&H, etc. Ridiculously expensive ($24 for soap, +$16 for a Teak bowl?). VDH, Surrey: Great performer for a glycerin based soap. I get more comfortable shaves with it compared to QED soaps. Still, beard softening is inferior to most tallow based soaps. Colonel Conk: Very similar to VDH and Surrey soaps above. They come in different scents. I like the Almond most. Tabac: I just tried it, so I won't say anything definitive. So far, it has been great. Classic Shaving Sandalwood: I got uncomfortable shaves with it. I think the lather is inferior compared to other glycerin based soaps, such as VDH or QED. Many gents had skin reactions to this product. William's: A classic shaving soap. At a similar price point, I got better shaves with VDH, Surrey, or Colonel Conk. And than, there is ARKO, which outperforms all of them. Last edited by brothers on Thu Nov 08, 2018 3:37 pm, edited 2 times in total. Here are a few of Chris Moss's excellent reviews dating back in some cases four years. These are insightful reviews as you would expect, written by someone who has a huge frame of reference, having tried nearly everything on the market. It's also interesting to read these and realize that even four years ago the English and German soaps we take for granted were very difficult to come by. Unfortunately, all of these above listed reviews seem to have been lost. Gents, here is my humble review of this shaving cream that I got to defray shipping costs on another purchase (PL8) to this big island called Australia. Why didn't I choose another scent you might ask? And it would be a good question. I realised that this had a sense of yesteryear and I smell violet essences on a daily basis on the person's of old ladies who come to me as patients. And while I'm not terribly fond of it in that way, the aroma does remind me of soaps that my mother once washed my brother and I with. It has a real old time feel about it. So I received the package and while more excited about the PL8 that was packed in the same box I opened up the Trumper's Violet first. The cream was so full its top surface covered half the inner lid. I took it off and took a whiff... yes the aroma of violets and old soaps came rushing into my head. The smell of Palmolive soaps of yesteryear... nice... it was only when I tried using it that I realised that this smell was pretty strong compared to other creams I've tried. It was seriously violetty. I took it to the bathroom and gave it a whirl... using about as much as I would of Proraso by eyeballing it... a purple coloured froth started and dissipated to a light pink... but I wasn't getting the usual good lather I would with face lathering... in fact it was so bad I wondered whether I might have lost some of the cream when I wet the brush... no... wow what a disappointment it was. I realised maybe using the stuff on the inner lid which I had might have been unfair since it may have 'dried out' or changed etc. Thinking it might also have something to do with unfamiliarity with the PL8 I decided to try again with my trusty Vulfix #2190 and some fresh cream from the tub... nice for one pass but the second application left a pale amount of lather. I'd been 'false shaving' - using a bladeless Rocket to scrape off the lather so my face was the same and was as receptive to the lather as it had just been. I resigned myself to the fact that people's impressions of Trumpers was right. That I had missed the boat... their creams had indeed become worthless and certainly not worth 11 pounds sterling. For some reason that's when I thought to try the new brush in a bowl again and used a bit more than an almond's worth of cream (almost 1.75 almonds worth) ... finally I had enough lather... but only just. In the end I'm disappointed with this cream's price to performance ratio. I have come to love the smell though... it really grows on you... but I guess I'll just have to use extra big helpings which is probably exactly as Trumpers wants it... to get a decent shave. I can live with that since it will help empty this nice tub which I'll press into service with other soaps. The tub actually matches the handle colour of the Simpson brush exactly a warm beige. His cologne: J. Peterman 1903. Now, let's see, where was I? Ah yes, performance. This cream reminds probably more of Trumpers than anything else. And maybe Penhaligons. But more Trumpers. I don't know where it comes from, but it has a density to it that many newer creams just don't have. It is sort of like what I imagine the old Taylors may have been like - very dense. Not hard like a dried out cream, just dense, and not totally smooth in texture. A little goes a long way. It is pretty high cushion, not perhaps the most cushioning thing I've ever used, but in the same tier. All in all, excellent performance, in very much the old school English cream tradition. As for scent. Well, honestly, if Indiana Jones was a little more sophisticated, this is what he would wear. It is very very earthy and masculine, in a sweaty, raw, adventurous, but still strangely sophisticated kind of way. It would be very at home with black tie, but you would be suggesting that earlier in the day you were at the least out on a hard ride across the ranch, rounding up a few strays, if not quite digging through ancient ruins for priceless treasures while juggling beautiful women and hostile natives. Or hostile women and beautiful natives, as the case might be. It is a very very earthy scent, definitely suggesting the out of doors. A lot of woody and mossy undertones. It is not mentioned in the description, but I swear vetiver is prominent. There is also a hint of leather and tobacco notes. But also a little green thrown on top, and other things that make it fresh, and not too heavy. Here, go read the basenotes commentary on the scent. (I really feel like, much like one of the commentators there, that I am making a mistake spreading the word on this). As for strength of the scent. It is probably on of the stronger shaving creams I have used. But not quite the room filling enveloping strength it apparently used to be. Probably not quite as strong as Coates Tea Tree, if you've tried that, but close. One about the same order as a T&H cologne scented cream. If your ideal shave cream is Coates Lavender, you would probably enjoy the performance of this a great deal, but find the scent a little heavy and overpowering. If you are like me, though, and like strongly scented creams, it is pretty ideal. All in all, a lot of potential to be my new preferred choice. I've been using this cream for a few days now, and must share my impressions. First, on the scent. This truly is the first 'Unscented' cream that truly smells like nothing to my sniffer. And, I've tried all creams of this sort offered by AOS and the three T's, all which at the end of the day, have a mild scent of something or other. With this one, I really tried hard to sense something, like a hint of coconut oil or anything, but nope, this thing really keeps its promise at being unscented. This alone won't allow it to be my everyday cream - but, and a big but - this might very well be a contributing factor to what makes it a winner, a great option for those days when your face must look 'perfect' off the bat immediately after the shave (and, I'm sure most of you know exactly what days I mean). I can get such shave a majority of the times using most traditional creams and soaps, but, I've come to learn that even the best of the best will at times irritate me, if only a bit, and as such my chin area will look mildly red for a little while. Hence my search for a product that will never fail, that I can count on during these 'special needs' times when I do not want to risk even a few minutes of redness or irritation. Performance. The best way to describe it, is just to say that it performs just like a good, old fashioned cream - BUT, it behaves quite differently. For better or worse, it is of a somewhat 'silkier' consistency when the lather is done and ready. They are very similar, but, there is a tangible difference. Where the traditional creams tend to produce, well, a somewhat more hydrated feeling, 'wetter' lather, which ironically seems to dry out much sooner, this cream produces a silkier, more slippery base that appears to remain the same up until the last stroke of the razor. It is an interesting concoction. The performance is quite good, as mentioned - silky smooth, and stays that way for the duration. Also of note, and perhaps the impetus of this review - I felt zero irritation throughout. Zero. After the fact, as if I had not shaved at all. This might be a fluke, and might prove wrong in the next couple of days, but, I don't feel that it will be the case, for this cream has provided shaves where the cream is seen but not felt, a new sensation for me, in all the times I've used it. Lastly, the package, I think is the worst part. A monochromatic theme, with a somewhat translucent glass jar and metal twist on cap. I find the traditional tubs of English creams much 'classier', and when considering glass jars, I think C&E has a more presentable, more polished look, IMHO. Bottom line, if you have easily irritated skin, and are looking for that one product that does not leave it's mark after the shave, give this one a shot. I have a confession and a testimonial to make. First of all the confession; I know that a lot of gentlemen on this board like Nancy Boy products. I have always been tempted to try some myself, but I must confess that every time I started to purchase some, a picture of Frank Barone pops into my head. Frank Barone is the family patriarch on "Everybody Loves Raymond" and he has a special use for the word "Nancy" on the show. For those of you who have watched that show, know what I mean. I'm sorry but whenever I think of Nancy Boy, I think of good old Frank. Evening, Armando was kind enough to send me a large sample of this unusual product, so, I thought I'd report a little on my experiance with it. This is, apparently, Olivia's version of, or take on, that old Italian product, Cella Sapone ( hopefully, some of that is on it's way to me as well ). This is one of those specifically European type products, like the Proraso/Omega tub or Martin de Chandre; that is a very very dense cream. So dense, that it almost has to be used like a hard soap. The first time I tried this, I went at it as if it was an English cream, and the lather I got was not encouraging. So thin that I daren't use it, and I added a dollup of Coate's Almond cream to beef it up. This time, I smeared some thinly on the bottom of my bowl, and whisked away, as if it was a chuck of hard soap. It took a little while, but eventually, I got what looked and felt like the lather from a good hard shave soap. It cut much like that as well. The second lather was pretty thin, but I went ahead anyway. I must say that I felt the blade more then I usually do! But, there were no problems. I squeezed the lather out of the brush manually for the third pass, and thus, had plenty of very wet, but still rich lather ( again, much like with most hard shave soaps ). The end result was a good shave, and my somewhat finicky skin seems very okay with this stuff. It's not quite the luxurious experiance one gets with the top shelf English creams, but it was a very good shave at the end of the day. The scent is suppossed to be 'almond' but it struck me as having a more floral or slightly 'fruity' scent. But it's a mild one, and not unpleasant. This is quite a fine shave product, IMO, and if it can be gotten without too much hassle or expense, I think it's worth having. I'll be interested to see how 'the original' compares when it arrives from Germany. I've been shaving with noxzema shaving cream for almost two weeks, achieving great results so I decided to share my impressions with you. It comes in a generous 150 ml tube which sales for 3.04 euros here in Europe. (in ITaly to be right, just to make a comparison here a tube of Proraso costs 1.94, Palmolive green or red 1,54, Prep 1,70). So a little more expensive than the average local store shaving creams but yet quite cheap to Taylo'sr or the other English T.
The Scent is quite spicey, not too strong, sufisticated I'd say but not everybody would like it as it is quite unusual. It has a hint of bay rum with notes of cinnamon to my nose. Actually I really like it and if you use Dominica Bay Rum aftershave it matches really well. The lather is very rich, it doesn t incorporate too much air even with my shavemac silver tip, but it can handle a lot of water, So not a great cushion over your face but the razor really glides over the lather, it soothes well your face being rich of essentials oils. I like to use it with a Gillette adjustable (7) and an Israeli blade. Rinsing your face after shaving your skin is soft and smooth, there would be no need of aftershave soothing lotion but a drop or two of Proraso could help neverthless. Overall I would rate it 8,5 out of 10, (9.0 if you like the scent), the only thing it lacks is a little cushion. It would actually deserve a try by you gentlemens. Tabac: Soap of the Gods. I always thought Taylor's sandalwood soap smelled of Harpic. Great performance, but horrible scents. As in realio, trulio horrible scents! I've said many times that Vulfix ought to get a proper perfume expert to assist with the scents, because the creams work very well. Similarly, I have bored many of you by pointing out that the 'sandalwood' cream really smells of the sludge in the bottom of a ginger beer 'plant' (I'm certain not one other member knows what I'm talking about - it involves a large winchester glass vessel, an indecent amount of powdered ginger, a lot of sugar, some brewer's yeast, warmth and patience. Wait two weeks and bottle the filtered ginger beer with some more sugar. Two more weeks and open with caution! Explosive, alcoholic, real ginger beer. But the sludge in the bottom of the winchester? Smells and looks like Vulfix sandalwood, which is a compliment of a kind). Some years back, at the dawn of SRP, the only creams ever mentioned were Proraso and Musgo Real. Even then, the vast majority of straight shavers used soap and weren't too interested in creams. The expansion of new shaving forums has in part been due to an interest in other products and the great variety of shaving creams is one of the never ending topics of discussion. Proraso still gets a lot of attention, though to be honest I don't like it much. I'd like to bring Musgo Real to the attention of those who haven't tried it. It is a very thick and heavy cream from Portugal, with the new mown hat scent of coumarin. Famously, it has a lot of lanolin in it, which is why Gordon can't use it. About three years ago the manufacturer tried to alter the formula, taking out the lanolin and for some reason adding boric acid, but this was not popular and the original formula returned. It is sold a a cream that can be used without a brush, but it is far better with one. Because of the heavy lanolin, it does dramatically better with some extra soap to break up the heavy cream - if you follow the instructions given on a tube of Palmolive red you will see what I mean. Just wash your face with soap, rinse, reapply soap to face, and then use the brush and Musgo Real on your face, dipping the brush in hot water as needed to adjust the water ratio. It's easy to make copious amounts of thick, shiny and creamy lather. It is very protective, even letting me use my wedge quite carelessly without ill effect. It seems to leave the skin moisturised rather than dry. I have not had problems with my brush clogging up with lanolin, and this might be because of the extra soap. It does seem to prefer a stiffer brush - the Chubby 2 Best goes perfectly. So if any of you good folk have yet to try Musgo Real, don't hesitate! For what it's worth, I think Taylor's the best of the reformulated creams. Their lemon and lime isn't as good as an original Trumper Limes, but it might just be the closest at a reasonable price. Perhaps I am biased by the fact that, at least, they were honest about the reformulation, whereas Trumper and Harris have denied that anything has happened. I am well aware of the concept of the Big Lie, and I'm not interested in swallowing it. CF Limes is excellent but expensive, and if you haven't tried it, you should. Vulfix Sicilian Limes is as good as the reformulated Taylor cream, and if TBBS ever manage to make J.M.Fraser the way they used to, it will be just as good. I shall pass quickly over T&H West Indian Limes (a scent I didn't care for, even before T&H went the way of the rest of the Creighton clones). Salter Essential Lime ain't bad, but no better than the Taylor's. I happen to have a 9/10 full tub of the original Trumper Limes. Would you like me to send it to you? Just PM me with your address. It should go without saying that no charge applies. I have tried all the Salter creams, and whilst I enjoy the scents, I have to say that they perform less well than Taylor's creams as shaving creams. They offer scents that are unavailable in other brands - I refer to the Fresh Mint (I know about KMF and Tom's, but they don't have the gorgeous confectionary smell) and the French Vetiver specifically here. They are interesting enough to be worth a tub just to enjoy the unusual experience scent-wise. On the other hand, they are decent creams, if a little over-whipped and fluffy. Use enough and you will have a great shave without having to visit Highgate. Conk soaps are fine as far as they go. The bay rum has the best scent of any soap bar Trumper's Sandalwood to my nose. They melt easily, but nonetheless, they are glycerine soaps, which means they have limited lathering ability. Glycerine soaps excel at making a creamy lather that contains few air bubbles. These lubricate well, but are not stiff and do not promote a close shave. However they are easy to use and good for beginners. You've been busy, Gary. Thanks.